Dog fights, love quadrangles, a nine-year-old shooting a full grown man off a motorbike, The Walking Dead season 9’s mid-season premiere has it all. 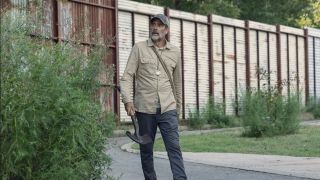 Beginning right where we left off with episode 8, Evolution, last year, Adaptation places a heavy focus on characterising both new enemy group The Whisperers and the former big baddie they’re replacing, Negan (name), who appears to be on the road to redemption (major spoilers for The Walking Dead season 9 beyond this point). But let’s start with The Whisperers first. We’ve already established that this cult of flesh wearing Walker whisperers are scary, adding a new layer of threat to The Walking Dead’s titular foe, but seeing them subtly unlocking gates, running towards characters with weapons, or writhing in pain borders on the hyper surreal, especially when the survivor that Daryl (Norman Reedus) and Michonne (Danai Gurira) captures turns out to be a remorseful, terrified young woman, and not the cannibalistic psychopaths we may have been expecting. That teenager, Lydia (Cassady McClincy), is of course being set up to play the love interest to Henry (Matthew Lintz), who will be replacing Carl’s role in The Whisperers storyline in the comics. Two characters from either side of a conflict falling in love against the odds? Anyone who recognises the similarities to Romeo and Juliet can safely assume this new romance probably won’t end with wedding bells. Aside from Lydia, we also get a brief glimpse of The Whisperer’s leader, Alpha (Samantha Morton), closing out episode 9 by capturing Alden and Luke as bargaining chips for Hilltop’s new hostage. While she only gets one line, it’s enough to leave us wanting more, and the sight of someone talking from beneath those masks will never not be blood curdling. Much of the mid-season premiere’s runtime, however, is devoted to Negan, who escapes the confines of his Alexandria prison to return to what’s left of Sanctuary for a nostalgic trip down memory lane. The entire arc - in which Negan saunters alone through abandoned streets as he acquaints himself with the undead and figures out what to do with his freedom - not only evokes The Governor's post-defeat wanderings of The Walking Dead season 4, but also plays out like something from a modern western. Each scene favours music over dialogue while Negan surveys the remnants of his fallen kingdom, powerfully contrasting past with present as he whistles to an inexistent audience, sits at the head of his empty roundtable, and wields a lead pipe as a poor man’s replacement for Lucille. It’s evocative stuff, especially as, for the most part, we can’t tell if the man is regretful for his past, or hungry for its return. We find our answer, however, when Negan decides to head back to Alexandria, leaving his former self amongst the ruins of Sanctuary for good. As he says himself when explaining the decision to Judith, there’s nothing left for him there anymore. Speaking of, Negan’s relationship with Judith is sweet enough to effectively win us over to this reformed Saviour, though you have to wonder what Rick would have made of his daughter being friends with the man who killed so many of his friends. The question now is whether Negan can win over everybody else in Alexandria, or if he’s going straight back into that prison cell. I’d wish AMC would do more to characterise Rosita beyond the men she’s partnered with. We should also talk about Rosita (Christian Serratos), who now finds herself at the centre of a battle for her affections between Eugene, Gabriel, and Sadiq, the latter of whom is apparently the father of her unborn child. Yep, that really happened. Apparently Rosita and Sadiq “messed around” before Gabriel entered the picture, and now she’s pregnant, so it probably isn’t just the sight of Eugene professing his love that makes her vomit. I’m really not sure what to make of this development at the moment, aside from the fact that I’d wish AMC would do more to characterise Rosita beyond the men she’s partnered with. She’s a fiercely independent character in the comics, and Serratos deserves better material than this faux Mamma Mia situation she’s now stuck with. For a mid-season premiere, Adaptation is a surprisingly subdued episode of The Walking Dead that featured not a single major or minor character death, instead taking the time to colour in its heroes and villains with richer shades of humanity. I’m even beginning to like this new and improved Negan, too, so AMC must be doing something right. Verdict: It’s another promising start for The Walking Dead season 9, with a mid-season premiere that manages to stay compelling even in the absence of any major plot progression.